Tanning. Oh, tanning. I’m very much still a newbie at it, but seemed to have developed a bit of a routine when I wanna slap on some bronze. As someone who was previously ghost-like by nature, I seem to have become attached to having a golden glow, so thought I’d share my tips from one newbie to (maybe) another. Step One: Exfoliation is Key | I always exfoliate for a day or two before applying any tanning products, as it helps buff away dead skin cells for a smoother application. It honestly makes such a difference as tan doesn’t go as patchy! I prefer using those exfoliating gloves that you can pick up from Primark for £1, as they’re much quicker and less messy than a physical scrub. Step Two: Apply Your Tan | I always use a tanning mitt when I do mine, as you don’t get those unsightly tan hands which are a pain to remove! I put a little bit of the product onto the mitt and apply in smooth strokes, concentrating extra on those rougher places like knees, elbows and ankles. I take any excess from the mitt and run it over my hands when I’m done, so you get an even application. For tans themselves, I use one of three. First up is Cocoa Brown One Hour Tan (which I’ve mentioned before), as the price is amazing for the product itself. It’s a mousse that develops in an hour (I prefer to leave it for three) for a lovely natural looking tan. Next are products from the wonderful He-Shi, which are a new brand but one that is already very much loved. Again, for a mousse I’ll opt for the He-Shi Gold Foaming Mousse, which applies evenly and does give an amazing looking tan. This takes a little longer to develop, so I prefer to apply it overnight. Alternatively, if I want a quick tan, I’ll apply some He-Shi 1 Hour Rapid Liquid Tan. This works in, as you can gather, one hour, or for a deeper tan in three, to give you that ‘week away in the sun’ glow. Both are wonderful products and the colour lasts for a good week! Step Three: Top Up Your Tan | After your rinse you tan off, subsequent showers should involve a quick, light scrub just to make sure your tan fades evenly and doesn’t go patchy. I always apply a gradual tanner or a light shimmer after the first day or so, just to keep my tan topped up as I don’t like layering a heavy tan too much. For this I love Karora Gradual Tan, as it gives a natural look without making you go too dark and hydrates your skin at the same time. Plus it smells like sweet lemons – bonus! If I’m after more of a tan enhancer, I love Nourish Golden Glow Toning Body Shimmer, which is a lovely moisturiser with added shimmer to really show off your tan. It’s lovely when applied to collarbones and places you want to show off! Step Four: Moisturise! 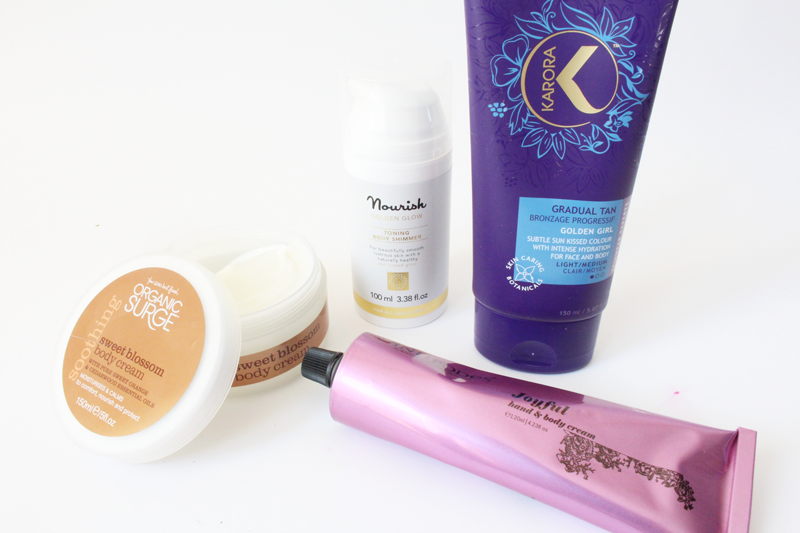 | If you want to keep your tan for even longer, moisturise every day or every time you have a shower. It genuinely makes a difference! I love the sweet berry scent of Antipodes Joyful Hand and Body Cream, as it (obviously) smells divine and hydrates like a dream! Another lightly fragranced product is the wonderful Organic Surge Sweet Blossom Body Cream, which has a orange scent and a little goes such a long way! Both are excellent moisturisers and are light enough to use in warm weather as they sink in fast! 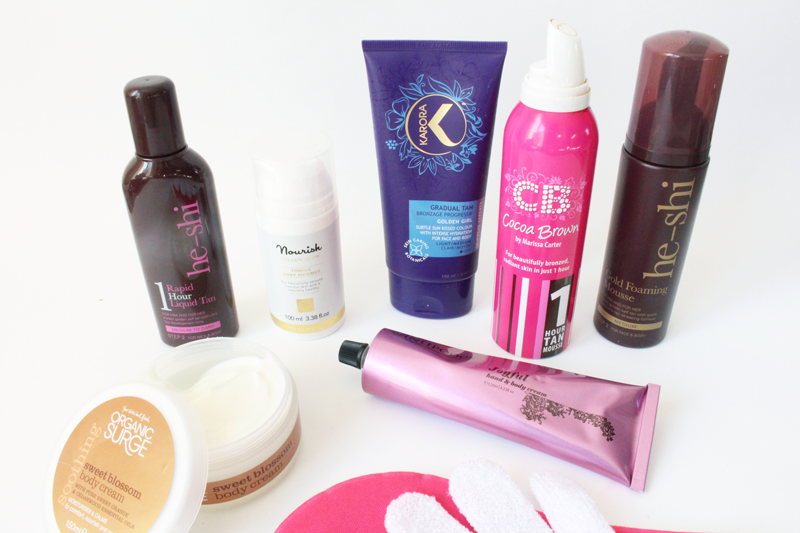 What’s your tanning routine or favourite products? Oh and check out my Dahlia giveaway too! Check out the lovely Maisy Meow if you’re after a new read!